Here at The Healthy Gut we are passionate about food. We talk about food, write about food, search for new and exciting ingredients, create new recipes, discover new places to eat… you get the picture. Food is our passion. When you receive your SIBO diagnosis, food, and shopping for food, can suddenly feel like a huge chore, and even be scary at times. We can take away any trepidation you might be feeling about shopping for SIBO friendly ingredients and instil some of our passion for food through our SIBO shopping tours. Join Rebecca on a shopping tour to discover how to buy food that is SIBO friendly, what to look for in food, how to ask the right questions and why buying seasonal food is great for your health. Learn which brands are SIBO-friendly and what to look for on food labels. Rebecca’s passion for shopping for food is contagious, helping you to feel confident that you can shop with ease for your new diet protocol. 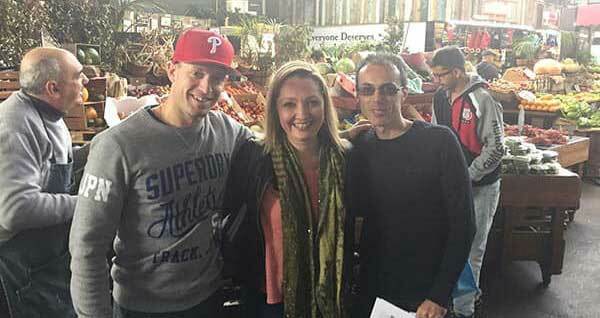 The tours will take place at the Prahran Market in Melbourne. Currently, these tours are only available in Melbourne, Australia. Please enquire if you are based elsewhere as Rebecca travels a great deal, and she may be able to accommodate tours in other cities from time to time. What happens on a SIBO Shopping Tour? Who is the SIBO Shopping Tour for? The SIBO Shopping Tour is perfect for anyone who wants to learn more about how to shop for food and fresh produce that is suitable for a SIBO diet. What do you get on a SIBO Shopping Tour? Tours can be arranged for individuals or groups of up to 4 people. » Why not make an event of it with a group of friends or colleagues? Secure your place today at one of the forthcoming SIBO Shopping Tours. But be quick! With only 4 places available at each tour, these events sell out quickly. At only $149 per person, this is a great investment in your SIBO journey and gives you the exclusive opportunity to spend one-on-one time with Rebecca Coomes. I found the SIBO Shopping Tour very useful. It is a very good opportunity to meet other people within the SIBO coaching program and other people who have SIBO and gut related issues. Rebecca is very helpful and provides great assistance with meal plans and what to purchase. She also helps you understand buying produce food that is fresh and organic. It is also a good opportunity to see where to buy the fresh and organic produce with the assistance from Rebecca of what to purchase and finding products you require. Overall. I think you should take the opportunity in attending a SIBO Shopping Tour. It is a good day out, it is fun and exciting. You also get to meet Rebecca and she is happy to assist with anything you require and provides great feedback. Hi Frank, thanks for joining me on a fun SIBO Shopping Tour. I’m so glad to hear it was of benefit to you. You are very welcome Rebecca. It was a pleasure. Very helpful and joyful. Look forward to attending others. A huge thank you Rebecca for a wonderful and informative morning on the SIBO shopping Tour. I appreciate all the information you provided me with about SIBO and I loved wandering through Prahran Market sourcing produce and SIBO friendly condiments. Your meal planner along with your SIBO Family Favourite’s Cook Book has made both shopping and cooking so much easier for be to treat my SIBO and also make cooking delicious, nutritious and easy meals that I can also feed my family. Going on this tour has eliminated the stress I previously had regarding food and family meal preparation. I highly recommend taking this tour as an excellent opportunity to experience meeting Rebecca and learning from her wealth of knowledge. Wouldn’t it be great if you filmed this for the rest of us in the US? Might not be my market but your questions and comments could be very informative. Then you could offer that for a fee. What do you think? The SIBO shopping tour was the perfect compliment to Rebecca’s cookbooks. So much of the initial treatment period of SIBO is a challenge and Rebecca’s cookbooks take a great deal of the uncertainty out of cooking. Of course sourcing ingredients can still be difficult, so often we don’t know where our food comes from and how this can impact our health. The shopping tour is that next step in understanding how to source great ingredients. It was also great to have the opportunity to talk about the condition with Rebecca who has such experience and an empathetic ear. A must do for anyone going through SIBO treatment.